Rolling Meadows, IL 3/8/19 — On February 25, 2019, the Commercial Law League of America returned to Capitol Hill for its Sixth Annual Hill Day. This year’s delegation numbered 24, making it the largest group to date. Collectively the commercial law activists had over one hundred meetings with Congressional members and staff. The group was broken into three teams: bankruptcy venue reform, bankruptcy preference reform and creditors’ rights. The bankruptcy venue reform team, which included retired Bankruptcy Judges Russell Nelms and Steven Rhodes, sought support for a new version of the Bankruptcy Venue Reform Act of 2018. This legislation, which was co-sponsored by U.S. Senators John Cornyn and Elizabeth Warren, would eliminate the ability of companies to file for bankruptcy in distant forums based on their state of incorporation or the location of an affiliate. The bill was drafted with assistance from Prof. Jay Westbrook of the University of Texas School of Law (who was also the 2018 recipient of the King Award). The preference reform team advocated for an end to abusive practices related to recovery of preferential transfers, such as trustees suing everyone who received payments during the 90 days before bankruptcy and filing suit on small claims in distant forums. The CLLA’s package of reforms included a meet and confer requirement prior to filing a preference suit, requiring that preference suits seeking to recover $50,000 or less be filed in the defendant’s home district and including payments made under settlement agreements within the ordinary course of business defense. The creditor’s rights contingent focused on H.R. 5082, a House Bill from the 115th Congress that made it out of the Financial Services Committee but did not make it to the floor for a full House of Representatives vote. 5082 sought to exempt attorneys actively engaged in litigation from the definition of a debt collector under the FDCPA. In addition, 5082 sought to remove attorneys engaged in litigation from CFPB authority unless the attorney was not a debt collector and is providing a financial product or service. Although it is unlikely that 5082 will be re-introduced in the 116th Congress, much positive feedback was provided, and the creditor’s rights team will continue to focus on drafting potential legislation addressing this critical area as well as reaching out to elected officials to build bi-partisan support. 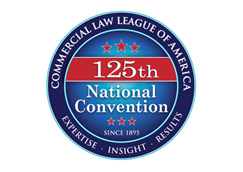 Rolling Meadows, IL 3/8/19 — The Commercial Law League of America (CLLA) is pleased to announce that at the upcoming 125th National Convention on May 2-4, 2019, at the Rosen Shingle Creek Resort in Orlando, Florida, the third-ever female President, Lorna Walker, Sweet & Walker, of San Francisco, California, will be “passing the gavel” to Timothy Wan, Senior Partner at Smith Carroad Levy Wan & Parikh, PC of Commack, New York. “As the third madam president, I am honored that I will be the one to swear in Mr. Wan. I have worked closely with him over the past few years and know he will do an excellent job. I am confident that our league will benefit greatly from his leadership and enthusiasm,” stated Ms. Walker. Attendance at the convention is open to members and non-members. For more information on the event or to register, visit www.clla.org/events. Rolling Meadows, IL 3/7/19 — The Commercial Law League of America has named Robert Ingold, Chief Executive Officer of the Commercial Collection Corp. of NY, as the 2019 President’s Cup award recipient. Mr. Ingold has held several key positions in The Commercial Law League. He has served on the Board of Governors of the CLLA, as a former chair of the Commercial Collection Agency Section of the CLLA, and as a former chair of the Eastern District of CLLA – the first agency member to hold this office in over 100 years. He is a past recipient of the CLLA Robert E. Caine Leadership Award. Mr. Ingold also served as a past President of IACC, and was a recipient of the IACC Leadership Award. Currently, Mr. Ingold is a member of the IACC Board of Directors. Mr. Ingold joined Commercial Collection Corp of NY in 1979 from Chase Manhattan as an installment banking officer. Since then, the company has evolved from a third party collection agency to a multi-service company in the accounts receivable arena – First Party collections, Lien Services, Credit/Collection Training and Seminars, Credit Reporting services and Letter Writing programs – with offices in Buffalo, Ohio, Louisville, Ft. Lauderdale, Saratoga Springs, Minneapolis, NYC and Montreal, Canada. Mr. Ingold is a frequent lecturer on the Art of Commercial Collections as well as other subjects relating to the industry. Mr. Ingold is a veteran of the United States Air Force. CLLA will present the award to Ingold at its 125th National Convention, held from May 2 – May 5, 2019 in Orlando at the Rosen Shingle Creek Resort. For more on Ingold and Commercial Collection Corp. of NY, visit www.commercialcollection.com. Rolling Meadows, IL 2/12/19 — The Commercial Law League of America is finalizing preparations for its 6th Annual Capitol Hill Day where important policy issues will be discussed and promoted on behalf of its members, constituents and in the interest of the credit and finance industry. This year, the following issues will be pursued. Wauconda, IL 4/25/2016 — Individual members of collection agencies have a new home within the Commercial Law League of America. At the 122nd National Convention of the CLLA, the Board of Governors approved the formation of a new section for collection agency members. Triadic business (forwarded between collection agencies, law lists, and attorneys) has long been and continues to be an important part of the CLLA and this section will further emphasize the value of that business to its members. CLLA members that are agency owners or employees will be eligible to join the Agency Members Section (AMS). While participation in the joint CLLA/IACC certification program will be encouraged, it will not be a pre-requisite for membership. The House passed HR 2947 on April 12 2016. The bill would overhaul the bankruptcy process for failing financial institutions. The measure passed in a voice vote, after the House Judiciary Committee moved it in a 25-0 vote. Hensarling said the next step is the Financial Services Committee passing a bill later this week that would repeal part of the 2010 Dodd-Frank law that gives the government the power to unwind a failing financial firm outside of bankruptcy in a process known as orderly liquidation authority. To view bill HR 2947, click here. Commercial Law League of America (CLLA) to Host 3rd Annual Capitol Hill Day in Washington, D.C.
Wauconda, IL 2/15/2016 — The Commercial Law League of America is scheduled to host its third Legislative event in Washington D.C., February 28 – March 1, 2016. CLLA held its first D.C. Legislative Day in February of 2014 and found the event to be very successful in building relationships with legislators. Historically, the League has focused on certain bankruptcy issues such as Venue and Preference Reform. This year, CLLA will expand the focus to include limiting FDCPA expansion. More information on these positions can be found on the League’s Hill Day Event page, visit www.clla.org/events and select Hill Day 2016 from the calendar. CLLA has a history of providing members and non-members alike with outstanding educational opportunities, many which provide state required CLE credit. CLLA has presented courses on Venue Reform for many years, as well as hosting a variety of events centered on the topic, such as the 2014 “Great Debate”. 2016 Capitol Hill Day is another such opportunity. In four separate actions, the Federal Trade Commission is announcing that it has stopped illegal debt collection tactics of several debt collection operations. In addition, other federal and state law enforcement officials have taken 12 more actions as part of a federal-state-local law enforcement initiative against deceptive and abusive debt collection practices. The cases announced today bring to 130 the number of actions taken over the past year by more than 70 law enforcement partners in Operation Collection Protection.